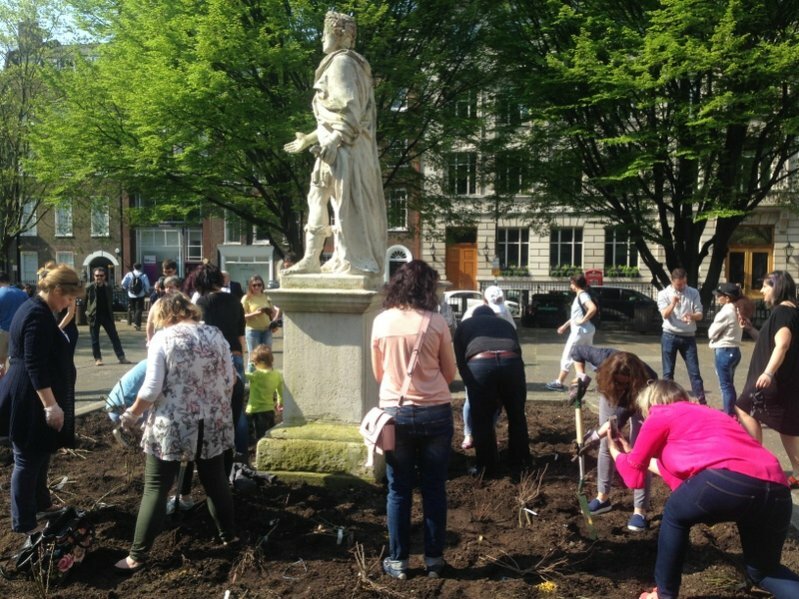 In a gesture to thank the UK, Bulgarians planted their national rose in a London square. They also submitted a report to London's mayor, Sadiq Khan, debunking the media's myths about them. The Bulgarians have not had a good press -particularly in the Sun, Daily Mail and the Daily Telegraph. The Sun sent a reporter to Sofia to portray them as rushing to hand out Britain just to claim benefits. The Daily Mail quoted a survey by a gambling company saying Bulgarians were the laziest people in Europe. The Daily Mail and The Telegraph have repeatedly highlighted that Britain is being flooded with them under EU rules. Yet very little is known about the Bulgarians in Britain..until now. Bulgarian academics at Warwick University and the University of Florida have carried out a detailed survey of 151 Bulgarians living and working in London for a report which has gone to Sadiq Khan, the London mayor. It is not a representative survey but it is full of insights. And it coincided with a remarkable gesture by the Bulgarians - who have planted their national floral pride - the Rosa Damascena - the perfumed rose grown for centuries in Bulgaria -in Golden Square, Soho - re-enacting a gift to London from Sofia 95 years ago-in 1923. The report says: "After 2013, this community was caught unwittingly in the crossfire of an especially heated immigration debate around Brexit, feeding off of public discontent and strong activity of the opposition. Bulgarians and Romanians have been collectively sneered with reference to perceived combination of cultural and social traits. This form of bias is still highly discriminatory, even if not directly versed in common understandings of racism (of quasi-biological labels and insult)." What the survey did was examine groups of Bulgarians living in London from their 20s to their 50s and 60s. One fact that shows the media coverage suggesting Bulgarians are here to claim benefits is completely refuted. Just four were out of work. The second suggestion that Bulgarians are lazy gets equal short shift - it turns out one of the favourite pastimes of Bulgarians in the capital - whether 20 or 50 - is going to the gym. Hardly couch potatoes then. And a lot are highly educated with university degrees or high school diplomas - they are not always able to get jobs suitable to their qualifications. Highly educated women were most affected "Many work as housekeepers, babysitters, care providers and “personal assistants”, says the report. But younger Bulgarians were getting jobs suitable for their qualifications. These included marketing or public relations coordinator, accountant, sales representative, teacher, programmer, as well as jobs requiring manual labour, such as a cook, car-mechanic, construction worker, barman, and stage worker in the theatre. The report does pick up damage done by right wing media coverage which meant that many were reluctant to work outside London because they thought the rest of Britain would be more intolerant about them being there. The report also says the majority were happy living London despite it being more stressful than their native country. One recommendation to the London mayor is that London helps ,particularly older Bulgarians, to become more fluent in English by laying on language courses. This would help the older generation of Bulgarians here become more integrated than they are.